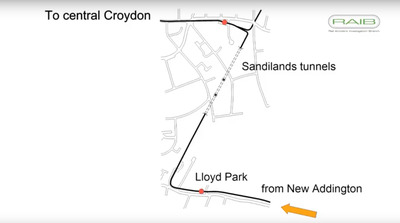 RAIBA frame from a video reconstruction by the Rail Accident Investigation Bureau showing a tram derailing in Croydon, south London, last year. 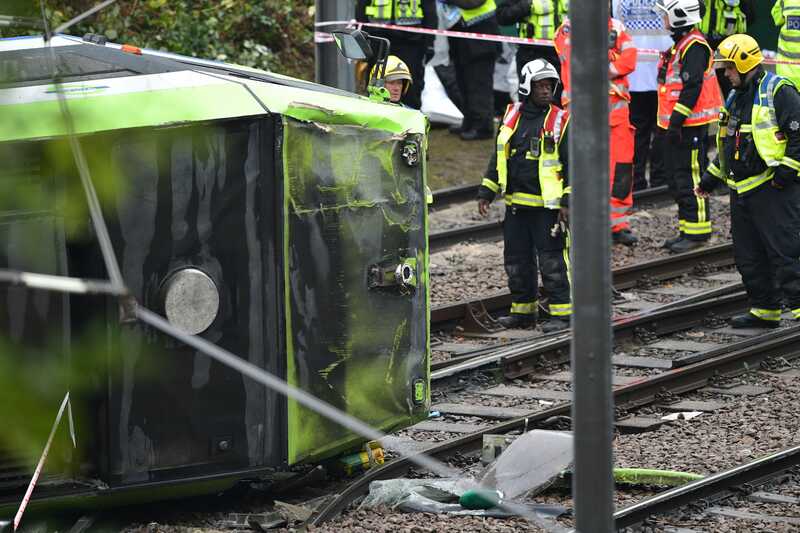 A London Tramlink service derailed last year, with fatal results. Rail crash investigators released a video reconstruction on Thursday. It showed the tram leaving the tracks at 78 km/h in a 20 km/h zone. Investigators said driver Alfred Dorris may have been in a “microsleep” at the time. Dorris is being investigated by police over a potential manslaughter case. Rail accident investigators have released a video showing exactly how a “catastrophic” tram crash unfolded last year, killing seven people. 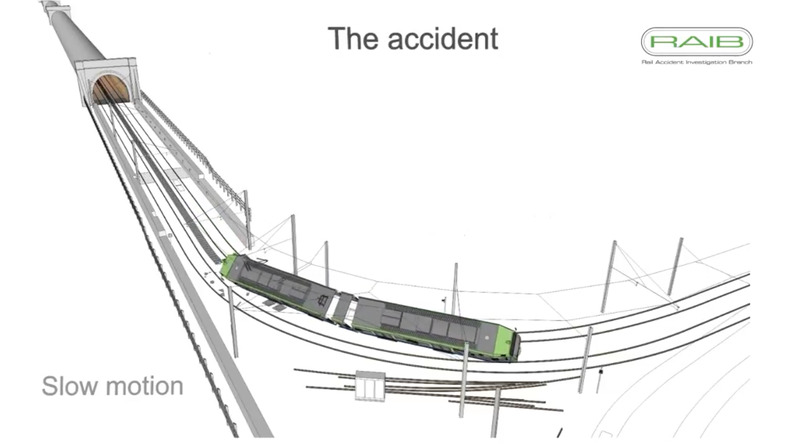 The UK’s Rail Accident Investigation Branch (RAIB) published animated footage showing how a London Tramlink service to Croydon derailed on November 9, 2016. It concluded that the driver lost control of the vehicle, and suggested that he might have done so because he was having a “microsleep” – a technical term for a brief period of involuntary unconsciousness. 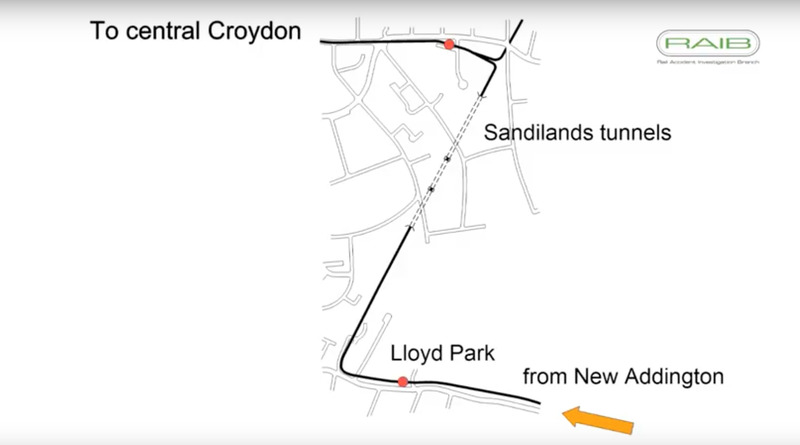 The video shows the tram approaching a tight left-hand curve after leaving a series of connected tunnels in the Sandilands area of Croydon. It approaches the curve at high speed, and starts to tip onto its right side as it proceeds. The tram carriage then tips over completely, and skids to a halt on the other side of the tracks. The impact killed seven people, left 19 people with serious injuries and 43 more with minor injuries. The driver was one of those with minor injuries. Getty ImagesEmergency workers gather around the wreckage of the tram which crashed in Croydon, south London, in November 2016. The tram was travelling at 78 km/h – close to its maximum speed of 80 km/h – when it left the tunnels. At that point the tram ought to have slowed to 20 km/h to successfully navigate. But it kept on at high speed, leading to it spiralling off the tracks. It concluded that there were “insufficient safety measures” in place, and recommended 15 steps to help prevent future accidents. RAIBA map from the Rail Accident Investigation Bureau showing the crash location. The report did not blame anybody for the accident, a task RAIB officials said is beyond its remit. RAIB said: “A possible explanation for this loss of awareness was that the driver had a microsleep, and that this was linked to fatigue. Officers from the British Transport Police have questioned the driver, named in the media as 43-year-old Alfred Dorris, on suspicion of manslaughter. A police spokesman told Business Insider they last spoke to Dorris in October. They are compiling a report on the crash, which public prosecutors will use to decide whether to pursue charges against him.